How is LibX different from other library toolbars? Is there a version for my library? What version of Firefox does it work with? Does it work with Internet Explorer (IE)? Can I have two editions installed simultaneously? How can I get the Google Scholar search to work even if my institution has not registered with Google? How do I uninstall LibX? We believe that LibX is different in several ways. First, LibX is designed to be easily customizable, allowing different editions to be built. Additionally, we believe that there is a difference in design philosophy. Most toolbars we have looked at simply provide a way for simple searches in one or more OPACs and databases. However, such functionality already exists in Firefox. Users can create Smart Keywords to automate simple searches in databases they frequently use. 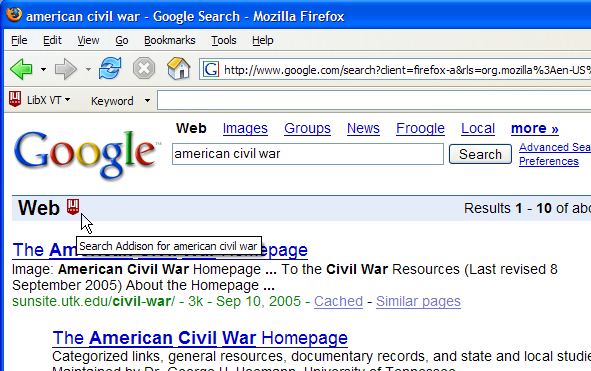 The Library Search project creates plugins that add searches to their Firefox search bar, many libraries offer an option to include simple keyword searches in their catalog as an option in Firefox's search bar using an "Add catalog to search bar" option. Similarly, many toolbars add a number of links to databases a library offers. We do provide the functionality to add links in LibX, but ultimately we believe that users will add frequently used databases to the Firefox Bookmarks Toolbar folder. The "Magic Button" - simply select an article title and have Scholar & the OpenURL resolver deliver an appropriate (accessible, "paid-for") copy. This is a feature we use daily for our own research, it's proved to be a tremendous time saver. Lookups of a complete book title, author, or ISBN - usually by selecting & right-clicking on a webpage. Proxying a page or link when coming from off-campus. Using cues and autolinking to get from pages that a user frequently uses to the library catalog. We do not aim to replace the library's OPAC; and although unlike most other toolbars, we do support moderately complex multiple-term (often called "advanced") searches in LibX, we will (probably) never support all options provided by an ILS's advanced search dialog. LibX is also different from other toolbars in that it integrates support for emergent technology such as COinS and xISBN. Check the current list of editions. Release 1.0 works only with Firefox 1.0.x. Release 1.0.2 works with Firefox 1.5.0.x. Release 1.1 and 1.2 works with Firefox 1.5.0.x and 2.0.0.x. Release 1.5 and up with Firefox 3.x - 6. Release 2.0 and up with Firefox 5 and up, and Google Chrome. An older version of LibX, LibX 1.0, used to work with IE. We have found supporting LibX too difficult, so LibX 2.0 does not currently support it. Use the Chrome or Firefox browser. No, technical limitations in Firefox prevent that. You can however create different profiles if you wish to use different editions. Go to the menu Tools -> Add-Ons. (In Firefox 1.5 or earlier, this entry was called Tools -> Extensions.) Select the LibX entry in the list. Click "Uninstall" at the bottom left (it looks like an X). Restart firefox. If you simply wish to not display the toolbar, you can accomplish this by selecting the menu View -> Toolbars -> LibX. An even quicker way is to right-click on a navigation bar button, such as the refresh button, and to uncheck the box "LibX". The IE version can be uninstalled like any Windows application in the system panel. How can I get an edition for our library? Why not let users adapt the toolbar themselves? What OPACs do you currently support? What server support do I need from our systems department? Will you host our edition, or do we need to host it on our servers? What do I have to do to make our edition "live"? What proxies do you currently support for off-campus access? What SID do you use for your OpenURL links? How does the Google Scholar search work? I've built an .xpi file for our edition, can you host it? Do I need an OAI identifier to use OCLC's xISBN service? How does LibX's automatic update feature work? If you maintain an edition, consider subscribing to the LibX mailing list. If you want to create and host an edition entirely by yourself, you have to be familiar with CVS and you must work in a Unix-like environment, such as cygwin on Windows, Linux, or Mac OSX. Assuming that have checked out the libx source from libx.mozdev.org, specific instructions are in src/editions/README. Don't hesitate to contact us if you need help. Why not let end users adapt the toolbar themselves? We felt that an extension that supports a community of library users should be offered by that community's library. That said, since LibX is open source, developers can add this functionality if they wish. In addition, end users can create their own editions without consulting with their library using the edition builder. LibX is distributed under an open-source license. If you use our edition builder, we request that you make your edition public and indicate whether it is endorsed by your institution. None. But please see question What do you charge? LibX is maintained as an open-source project. As such, the amount of effort you can expect will depend on its success. Your call. We can host your edition at libx.org or you can host it on your site. We recommend however that you advertise LibX's availability to your users on your web pages. Check out the editions page for web pages that libraries have created to advertise LibX to their users. Note that while those pages are hosted on the libraries pages, LibX itself is hosted on libx.org. Build it, test it, and select the "Make Live" button in the edition builder. So far, we support only EZ Proxy and III's WAM (Web Access Management) method. Currently, these seem to be the two most widely used options. Some libraries use virtual private network (VPN) access, which is set up outside the browser. Some libraries use proxies that are set up as http proxies in the browser's preference panel. Users of those libraries may wish to install the SwitchProxy Tool. By default, we use libx:institution, e.g., libx:virginiatech. However, the SID to be included in OpenURL links is set as part of the branding. You must make sure that your linking server accepts this SID. Some OpenURL resolvers (e.g., Serials Solutions) will return results no matter what SID is provided. Others (e.g., WebBridge) require that every SID be known beforehand to the OpenURL resolver. For those resolvers, you have to make sure that the SID you use in your edition is accepted by the resolver; this can be done by adding libx as an Origin in the resolver's management module. In addition, in the case of WebBridge, you will also have to specify what III calls 'resource categories' that should be displayed when a request arrives. The simplest strategy is to include all categories, unless there is a desire not to show resources in a certain categories when requests from Libx arrive. Alternatively, use a SID that might already be set up, such as google, Gale, or others. In addition to making sure users will see the correct links to the library's electronic holdings, we also like to get accurate statistics about how users are using LibX. For systems that are hosted by an outside provider (e.g., Serials Solutions) you'll have to contact the provider to record hits coming from LibX. As LibX becomes more widely adopted, we hope that those providers will provide support for it by default. For self-hosted systems, such as WebBridge, adding the SID via the management interface (usually at http://yourcatalog.institution.edu/webbridge/edit) should suffice. Frequently, researchers need to quickly lookup a paper from a citation or reference. The Google Scholar search allows a user to select all or part of a reference and run a search against Google Scholar's database. The results are being analyzed and if a matching hit is found, the institution's OpenURL linking server is invoked. A linking server, if properly configured, gets the user straight to an article to which they have access (as opposed to a publisher's page where they are asked if they like to buy this article if the publisher does not recognize them as coming from their institution.) The actual Google Scholar results page is also displayed to the user. Recently, we have added an option that would completely hide from the user that Google Scholar is used. Instead, on a miss, the user would be redirected to the URL provided by the offering institution. This approach, which requires a custom OpenURL server, leaves the user's experiences more directly under the offering library's control. Can I get the Google Scholar search to work even if my institution has not registered with Google? Yes. Simply set in your preferences that Library Links should be shown for a library that has registered with Google, such as Stanford. LibX will rewrite links to point to your institution's OpenURL linking server. Although most libraries will not have the subscriptions of these larger institutions, this provides a way to offer your users a path to an appropriate copy, possibly in print form or via ILL that they would not find through Scholar. The original Scholar results are still being displayed to the user in an additional tab. No. (Not even when the .xpi file was originally built on this host.) You have to use the edition builder if you wish libx.org to host the file. You're free to host the .xpi file yourself, however, since LibX is distributed under an open source license. We don't do that because we then cannot provide updates to this edition when there is a major Firefox upgrade. More importantly, since Firefox extensions are trusted and run with full privileges on a user's machine, the user should be confident that what they download from a source did indeed come from that source. Do I need an "OCLC xISBN LibraryLookup Service OPAC Identifier" to use OCLC's xISBN service? OCLC recently upgraded xISBN to a 'production service' LibX has integrated those changes. The text below is somewhat out of date. No. For LibX to use xISBN, all we need to know is your catalog type, e.g., whether you're using millennium, voyager, or aleph, and - in some cases - the specific version/subtype. Signing up for an OCLC xISBN LibraryLookup Service OPAC Identifier makes it easier for LibX to use xISBN, in particular when the subtype isn't known. These subtypes correspond to slight variations between different versions of an OPAC. For instance, there are (at least) five different versions of Sirsi, at least six different versions of Aleph, and several versions of Dynix/Horizon IPAC system. OCLC's xISBN supports them all, but unless you have an OPAC identifier with OCLC, it needs to be told exactly which version your catalog belongs to. If you don't have an identifier, and if your catalog doesn't work with the default xISBN settings for your catalog type, you must then configure this version in LibX edition builder by inputting the correct "OCLC xISBN LibraryLookup Service OPAC Type." For instance, you may need to use aleph4 instead of aleph here. If you have an "OCLC xISBN LibraryLookup Service OPAC Identifier" identifier, OCLC will remember the specific type and version of your catalog and automatically use the correct syntax, making LibX's job easier and the service more robust, even if you upgrade your OPAC. The comments above relate to the configuration that is necessary for your edition to use xISBN successfully. xISBN can always be accessed by selecting an ISBN and using the right-click menu. In addition, ISBN-based cues can be made to point at the xISBN service (rather than directly at the catalog.) by checking the "Cues Use xISBN" checkbox in the edition builder, which appears if "xISBN Settings" is checked. Automatic updates are only supported for live editions. An automatic update will show up when users check for automatic update in Firefox. This happens either periodically or when the user selects Extensions -> Find Updates; it also happens when the user installs a new version of Firefox. In this case, the user will see that an update is available and is prompted to install it. The new build will be active after the user restarts Firefox. To use the automatic update feature, simply make your test revision in the edition builder live (after building and testing it.) Making it live also freezes it - to make further changes, you must create a new revision by making a copy of the current live revision. Will you give me CVS write access? How is LibX different from Greasemonkey? Source access is via CVS at libx.mozdev.org. Submit patches and code to libx.org@gmail.com. We also need documentation, tutorials, etc. etc. We also particularly welcome ideas for additional cues on web pages (such as the ones we put in google.com, search.yahoo.com, amazon.com, barnesandnoble.com), or ways in which OpenURL results can displayed in a more consistent way on publisher's sites. After we've seen one substantial contribution. "Substantial" here means something beyond a bug fix. Greasemonkey scripts can be added by the user. LibX scripts must be added by a developer (which is why this entry is in the developer's section.) Users should note that LibX and Greasemonkey can coexist. As such, LibX could provide a platform for the delivery of library-based localization services such as unAPI or similar services, after prototyping/testing them with Greasemonkey.